Once in awhile there's a guest review that really makes me want to get up and get a product - this is one of those. 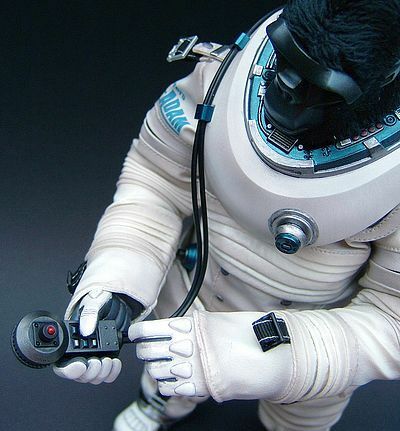 Jeff checks out a big monkey tonight, and it's not just any monkey, but a Space Monkey! Tell us all about him, Jeff! I like monkeys, you like monkeys, EVERYBODY LIKES MONKEYS! Well, before I go too far, I say monkeys, I guess if I’m going to be anthropologically, zoologically and biologically correct I should have said great apes… after all Adam here is most definitely a Gorilla! 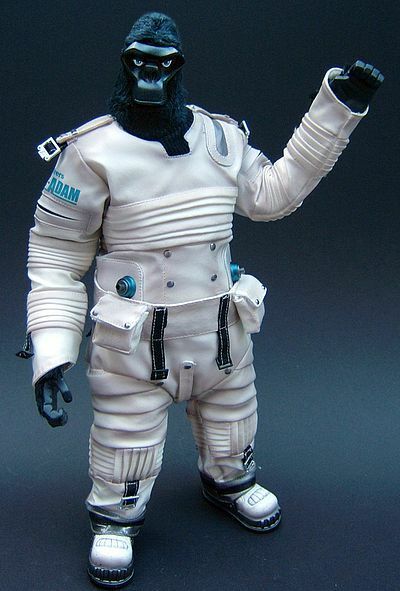 And this version of Adam, the king of the ape nation (there was an earlier version who was a mountaineering explorer) manages to bring two of my favourite things together, apes and space suits! Winson Ma, the creative talent behind this guy has a long history of creating white-hot designer toys that get you salivating for things you didn’t even know you wanted. He was part of the Brothersfree collective (along with William Tsang and Kenny Wong) behind the uber cool Brothers Worker line of figures. 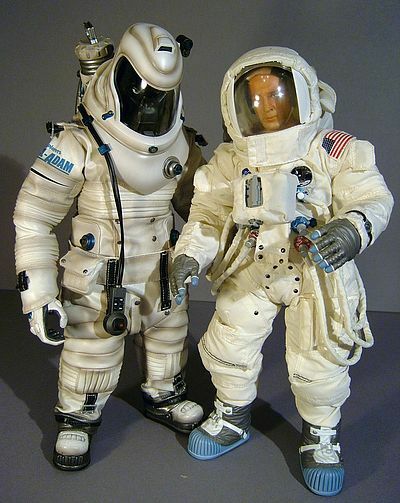 When I first got into hi-end 1/6th I used to look at these figures on the Kid Robot website desperately wanting to own them, but not truly understanding what they were, where they were from, or what they were about. The truth is, that like the majority of modern or pop art it doesn’t necessarily need to be understood, it just needs to be appreciated, or better still ’loved’! The thing about the Brothers Worker characters is that these weren’t super heroes or heavily armed soldiers; instead they were construction workers, mechanics, welders and photographers. 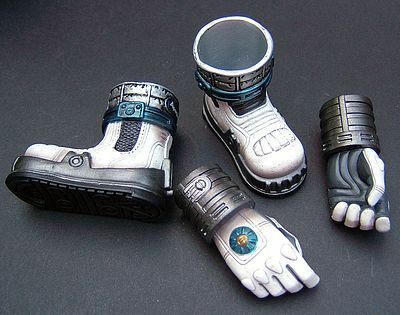 And they came with an abundance of super detailed 1/6th accessories, often made of real metal. 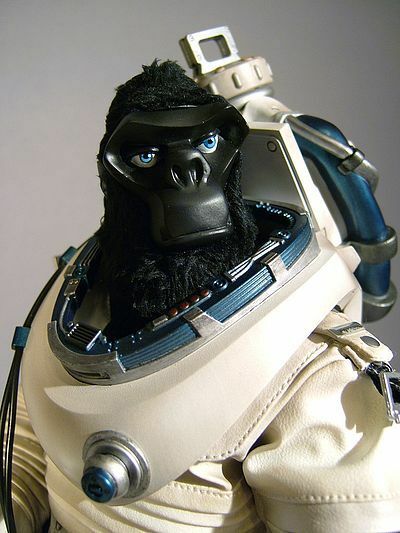 So, fast forward a few years and Winson Ma goes it alone, creating his own universe in which highly evolved apes live alongside humans, you can find out the full back story by navigating around the official website here. This is my first Apexplorer, but I hope it won’t be my last, and as Winson Ma recently unveiled his plans for Apexplorers Ep II- Black V, (Heavy Industry), it’s due for 2011, I hope to get some companions for Adam in the not too distant future. You can follow Winson Classic Creations on his Facebook page here - to find out what is planned and when. I asked Winson via his page what he had planned for the line but he was pretty tight lipped, he said he was hard at work on the project as we speak, and he hoped to have something exciting to show very soon. Don’t make us wait too long Winson! Although manufactured by Hot Toys, the fact this is an ‘original’ license from Winson means it still has a very ‘indie’ feel to it, which I think adds to its charm. But there is no denying that working with the behemoth that is Hot Toys has many benefits, not least the fact that this comes in a huge and quite frankly lavish box. It measures in at a full 17” x 16” x 5”, and being the special ‘white’ version it is somewhat obviously predominantly white! 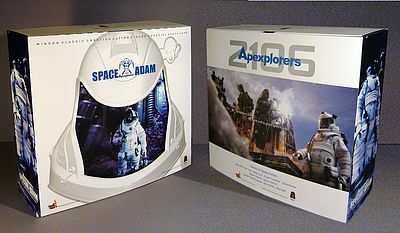 First we are met by an outer sleeve, the front has a 3D rendered image of the helmet, it has the Apexplorers logo above it and the full visor is a die-cut window showing the front of the inner box. The back has a Photoshopped image of Adam against a re-imagined C-Ape Canaveral (sorry! 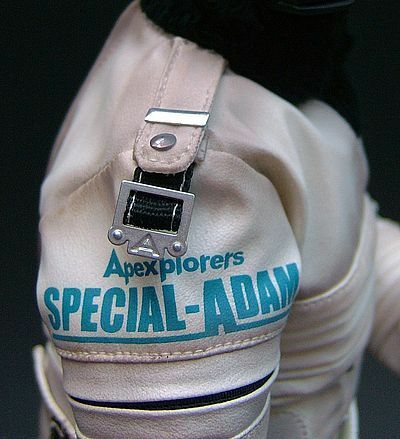 ), with an Ape designed shuttle ready for launch, and the side panels show Adam in his full EVA suit. Slide this off and we are met with the front image of the inner box. 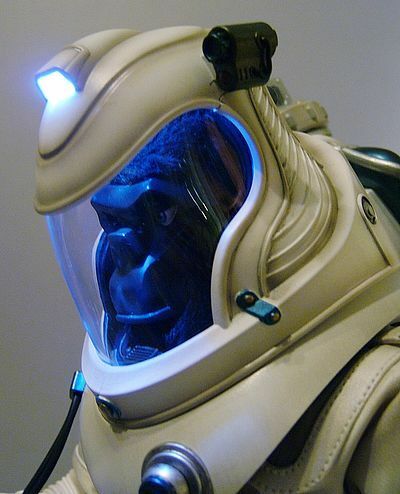 This has a large picture of the Ape shuttle landed on a planet/moon with Adam in front of it (obviously this is a planet/moon with a breathable atmosphere as Adam is helmetless). The back has a huge gallery of photos, some of which are glossy spot laminated. The front of the box opens down like a drawbridge, it’s held in place by magnets, but once released it shows a mock interior of the Ape ship. The front is like a display ‘locker room’ showing the figure in a central window with his accessories in two windows set on either side. The flap that comes down shows a mock ‘shuttle’ interior floor, this (in the case of the special white version) has a certificate attached, hand signed by Winson Ma, it carries a pencil sketch of the character by the artist alongside a brief bio for the character. It also has an edition number and a blind embossed logo. I would imagine this cool detail will be considered by many (myself included) to be the veritable icing on this already impressive ivory coloured cake. Inside the package Adam is held secure in the usual black vac-formed tray alongside his accessories without the need for any twisty ties. All in all this is a very impressive piece of design, and all the more impressive for the fact that although this is in point of fact just a variant on the main ‘red’ release, it has a totally unique piece of packaging. When I reviewed the 3A Heavy TK I remember saying that when it comes to the sculpting of designer toys it’s difficult to be too ‘overtly’ critical, as if the art direction is overseen by the creator, then who the hell is to tell him/her that he/she is wrong, after all it is about their vision, not yours? All you can do is decide whether you like it or not… but why would you choose to own it if you didn’t? 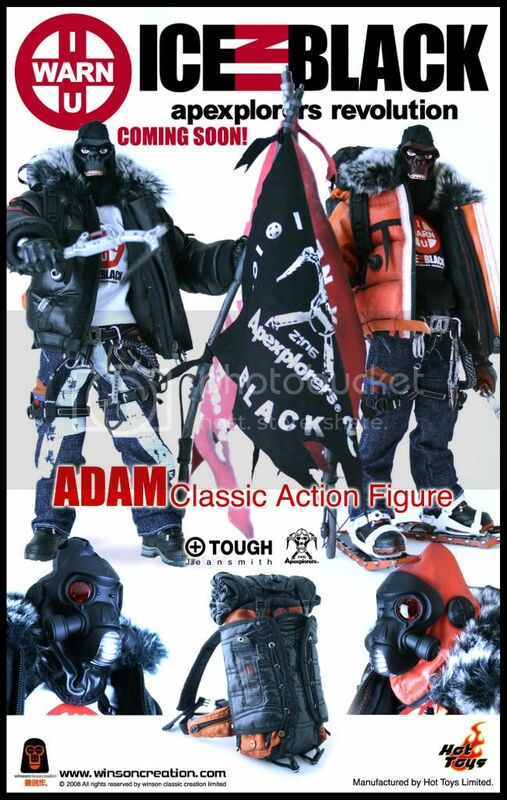 Of course there is always the chance that something could go horribly pear shaped with the actual manufacturing between the prototype being approved and the production figure hitting the shelves (and lord knows it wouldn’t be the first time), but I’m glad to announce that no such problems have befallen Space Adam here. In fact, he has turned out as close to manufactured perfection as I would imagine it is possible to get! The face is a minimalist, clean and unfussy master class in urban caricature. The ape features are pared down to simple shapes that capture the feel of character so well. The heavy brow sweeps around the sides of the eyes like a thick ribbon to make hooded sockets, the form of these facial features takes a heart shape with the wide nose sitting flat in the centre of the face. It has an ergonomic/cubist feel to the sculpting style, if that makes any sense. From the sides of the face and covering the rest of the head is a tight form fitting black fur covering, through which his ears protrude on either side. If you look closely you can see a seam running down the back of the head, but it is very well concealed and will remain invisible to all but the most prying of eyes. He comes with two pairs of hands, one gloved and one ‘au naturel’, both follow the same cubist aesthetic of the heads sculptural design, it’s a similar look to the 3A humanoid figures, meaning they would make great shelf companions and could easily share the same universe. This guy also comes with some very cool hardware that straddles the outfit and accessories categories, but I’ll cover that later. As it stands, purely rating the quality of sculpt on the head and hands, then to me this is a 100% full score piece of work, beautifully executed and finished to ‘designer’ perfection. It actually manages to look like a 3D animated character made real. The paint on the actual head and hands is minimal to say the least, but there is a lot of highly detailed work on the accessories and outfit. The head just consists of the paintwork on the eyes (which is crisp, precise and clean), while on the hands; it just covers the detailing on the gloves (which is also well applied with clean division lines and some nice subtle weathering). So, it’s a relatively simple app, but it’s carried off to perfection and suits the source material down to the ground. 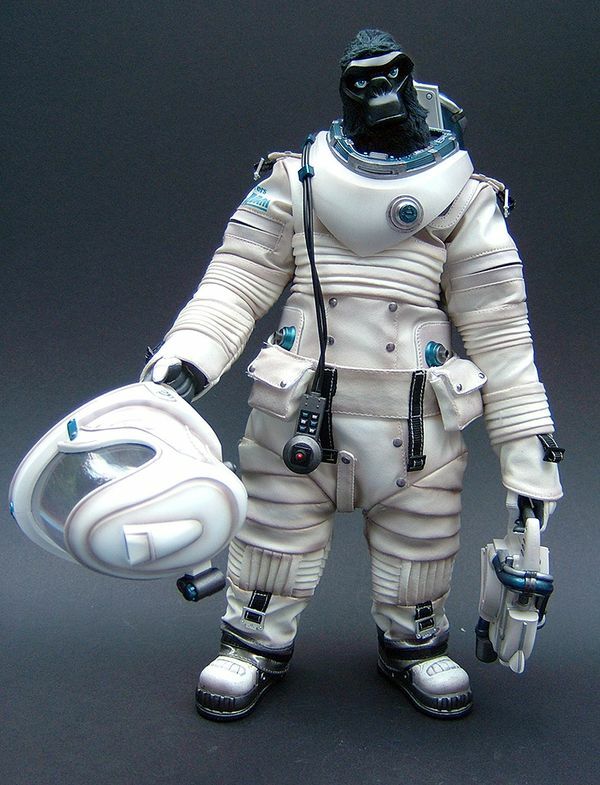 Did I already say I like space suits? I did, didn’t I! Well as much as I love the stylised look of the sculpted characterisation Ma has done on Adam, it’s the outfit and hardware that really made me weak at the knees! He was available in two colour-ways, a regular version in a rich red colour-way, which I liked a lot. 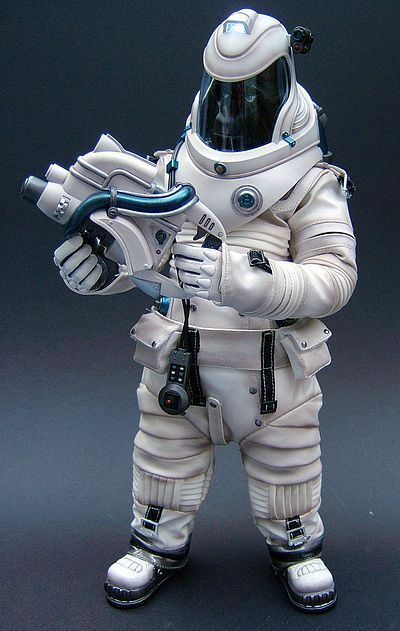 And a limited edition white version… now, as I said, I liked the red, but when it comes to some extra vehicular deep space activity, then for me it just has to be white! The suit consists of a pair of heavy duty sculpted boots with sculpted ankle collars to ‘suggest’ the hermetic seal between them and the suit, flip them over for a look at the soles and you’ll see Winson has even incorporated the “A” of the Apexplorers logo into the tread design… sweet! The suits legs actually just sit over the tops, but it’s cool that even though it’s hidden from view the details are all there. The suit itself is a one-piece garment that zips up the back. It is made from ivory coloured, plastic/pleather coated fabric. 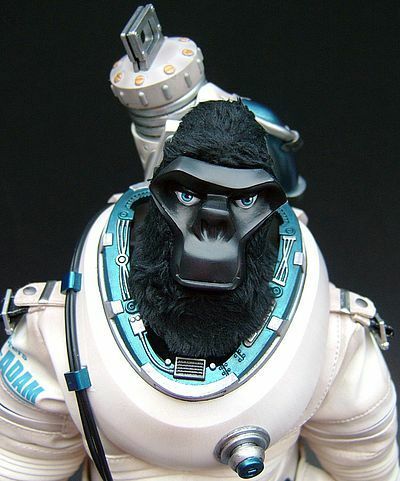 It’s tailored to fit the TT well, but it also mimics the physiology of Adams gorilla like anatomy, meaning the legs are shorter and the arms are longer. It also means the base TT would have benefited from a slight re-working to give the legs a lower knee joint. 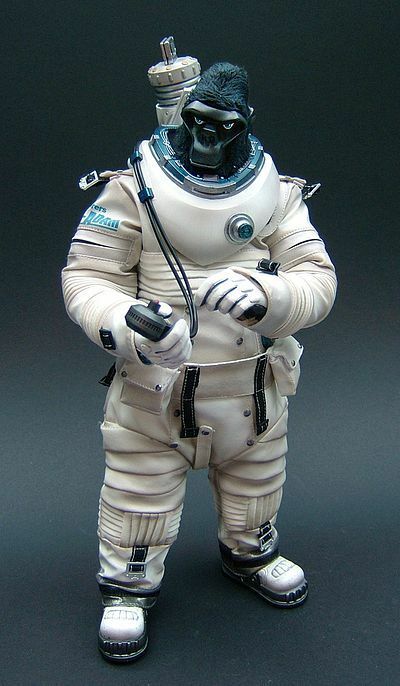 However to be honest he poses just fine and the thickness of the suit (along with the padded fat ‘monkey suit’ he wears beneath the space suit) means the leg articulation, particularly at the hips (which are actually situated at the waist position on Adam), are pretty limited. But with just a little manipulation you can still get some great poses in both general standing and even walking positions. 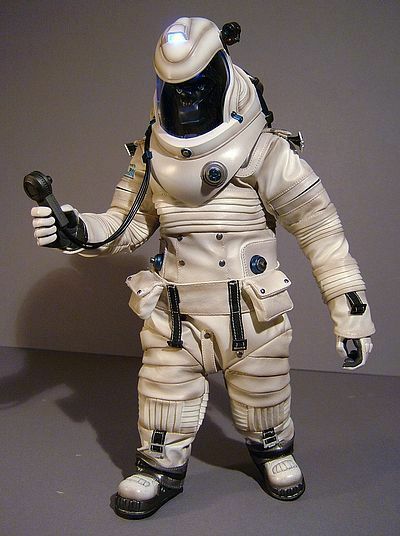 The suit is traversed with pleated and ribbed lines to aid in the flexibility at the positions where most movement occurs there are also webbing straps with buckles hanging at various positions on the arms and legs. He wears a wide belt at the waist that has two opening pouches and yet more webbing straps, it fastens at the back with a plastic clip buckle. 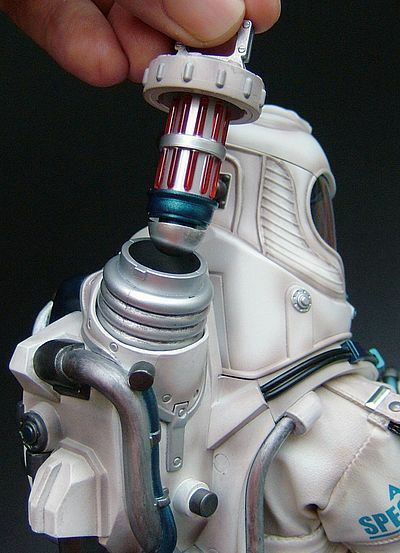 The whole thing is then given an airbrushed treatment to add weathering at the seams. The quality of the stitching and the consistency of the pleated folds is all top notch, you’ll even notice a couple of concealed zip pockets on the upper arms, these are non-working, but again the quality of the fabrication is just perfect. There’s a metallic gunmetal fabric used on the ankle cuffs and an asymmetric panel using the same material crossing over the left shoulder under his epaulette. Lastly he has twin outlets/hose attachments just above the waist on either side of his stomach and a couple of lines of metallic rivets running up either side of the front panel. All in all this is a very cool and creative outfit and one that is fully deserving of a top score. OK, he was on such a strong run there, 4 full score categories in a row, I guess it had to come to an end. But don’t get me wrong the accessories are uber cool, but I still feel a few more little bits and pieces might have been nice. I’d have especially liked a holster or harness to fit the weapon into when not being held. And an ape nation flag and moon crater base would have been sweet as well, but enough with the what if’s and why not’s, I’m here to grade what we get, and what get is carried out very, very well. I’m going to include the back-pack, helmet and gun in this section, which is unusual as some of those parts would normally seem better suited to outfit, but on this occasion, because of the nature of the way they work, they just seem better grouped in with accessories. The backpack fits over the shoulders with a hole for the head to pop through, it looks like a classic piece of modern product design showing smooth clean-cut lines. The back is asymmetric and covered in pipes, cables and rivets. The top of the right hand side (viewed from the back) even has a removable power core; at least that’s what I see it as. However the back of the box lists an ape DNA test tube, which I think it might be intended to be. It has a carry handle and a detailed steel and red bar that protrudes from its underside, this countersinks into the aperture in the back pack and locks in place with a single twist. 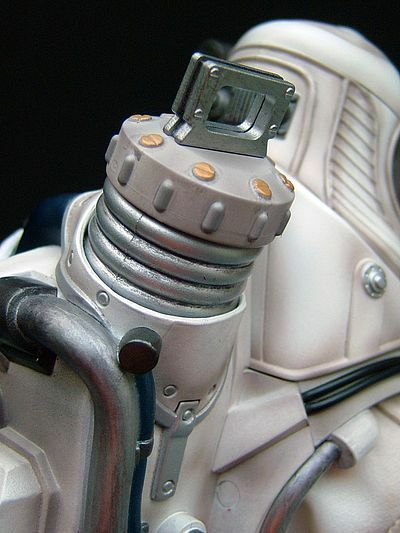 There are twin cables running over the right shoulder that hang loose at the end where they join to a control box. I imagine this is meant to control the thrusters at the bottom of the back-pack, they’re not big boosters or rockets, but more like propulsion thrusters for space walks or added mobility on low gravity planets. The detail continues around the edge of the collar showing the mechanics of its hermetic seal where it couples with the helmet. The helmet itself is formed to emulate the shape of Adams Gorilla head, with it’s shallow and steeply banked cranium, so we have a low brow with a wide sweeping visor for broad visibility. 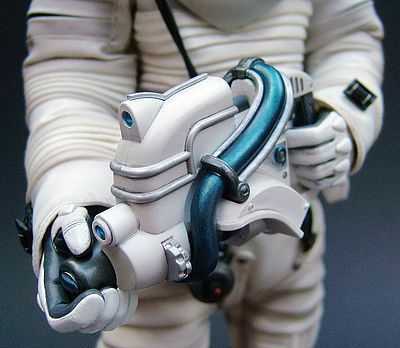 It has details and tooling over its surface and a video camera mounted on the right hand side. 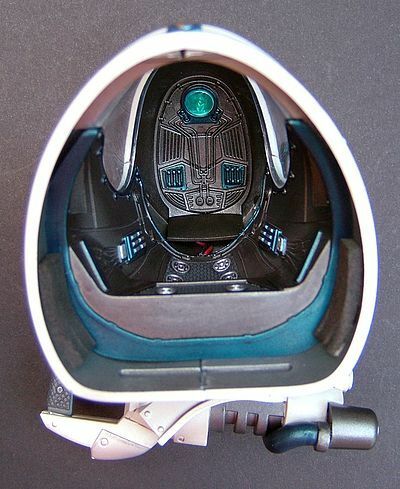 And if you take a look inside you’ll see the interior is highly detailed as well. The back section, which is actually shielded by the backpack when in position, has a small panel for batteries. ‘Batteries’ I hear you cry, why does he need batteries? Well there is a small button concealed on the lower right hand side of the helmet, it matches with a detail on the other side as well. 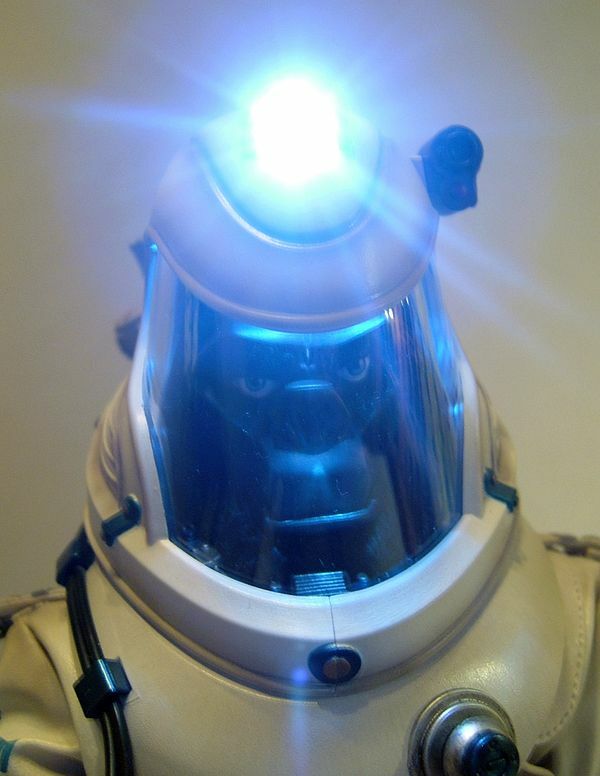 When this is clicked a bright light shines on top of the helmet and a smaller light comes on inside to illuminate the face, just depress and click again to switch it off. The helmet locks in place tightly over the collar, and the whole rig fits well on the figure to hang convincingly and with some weight. Next up is his weapon, it’s called a blaze gun and its design works perfectly with the rest of his hardware. It looks like a cross between a gun and some kind of futuristic power tool, which again fits well with Winson's back catalogue, he’s always seemed more interested in the urban side of things rather than the military. The front of the apparatus has three holes, which have countersunk metallic lenses. A large steel coloured one at the bottom and two smaller blue ones above it. 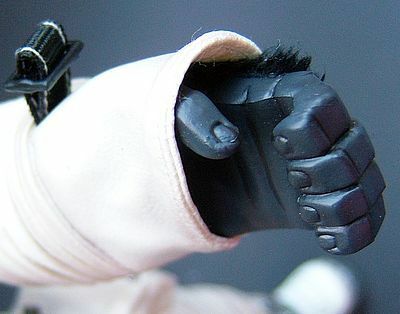 He also comes equipped with a pair of un-gloved hands; these have a great ‘urban vinyl’ aesthetic, meaning they wouldn’t look out of place on a 3A figure or even a Jamie Hewlett character. They are in a general gripping position and even have some of the ‘fake fur’ as used on the head, stuck to their backs. Lastly Adam has the classic HT stand bearing the Apexplorers logo. So, not a huge haul of goodies, but the stuff we get is beautifully carried out and the light up feature puts a nice glowing cherry on the cake. Almost perfection! Well, believe it or not, under all that monkey business is a classic Hot Toys True Type, and we all know what that consists of, but if you do happen to have just got off the last shuttle from Uranus, you can get up to speed by reading the links here and here and I have another photographic update/round-up planned for the latest few TT releases very soon. This version does have a slight tweak though, in as much as the fore arms are slightly longer to add more authenticity to his gorilla anatomy. 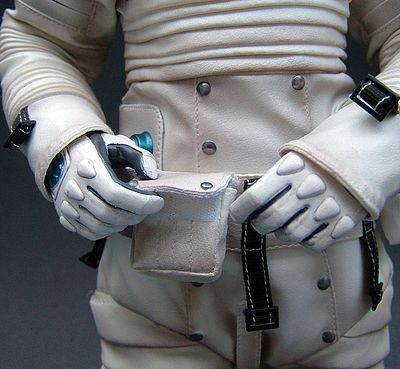 He wears a white padded suit over the TT to give extra implied weight to the gorilla physique that Adam is supposed to have, it fastens up the back with Velcro and adds the necessary bulk to make the way the space suit hangs look all the more natural. As I said above the thickness of the under suit and over suit combined with the position of the TT’s articulation does hamper a little of the hip and waist articulation, but not enough to cause any great concern, and as we all know, the TT is still just about the best base bod out there. 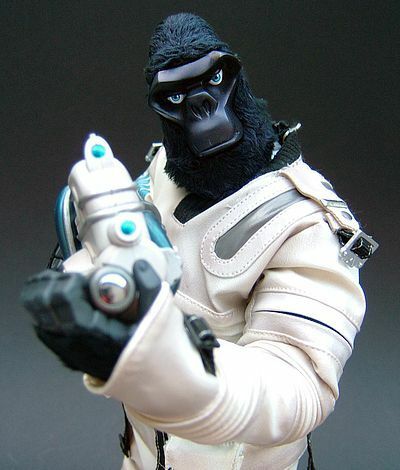 Sideshow had the red suited version up for the full RRP of $199, but he sold out pretty quickly. I don’t think they had the white version on offer, but considering it was made in such a low edition size (a mere 400 were manufactured) I’m not too surprised by that. This version has already jumped in price on the collectors market where I’m seeing eBay prices of between $350 to $450, and I’m guessing the exclusive hand signed sketch that comes with it might be one of the factors that is pushing that price ever more skyward! The red version can still be found for between $185 to $200. So, if you can pick this guy up for under $190 (unlikely now in the white colour-way, but you never know) then I have no qualms in giving him a full score. The work on the outfit and the cool light up feature make this a hugely impressive figure on the shelf. As far as the higher prices go, well $300 plus is a lot of moola in anyone’s language, so the choice is yours! Full score no problem, I’ve had tons of fun playing around with him while doing this review and he’s even earnt himself a place on my shelf in our front room. The fact he is an original piece from a non licensed source gives him even more kudos for me, as whenever people see him, the first thing they ask is ‘where’s he from, what’s he about?’. And the fact he just exists purely because a cool toy designer decided he should, makes him all the more desirable, well for me anyway! 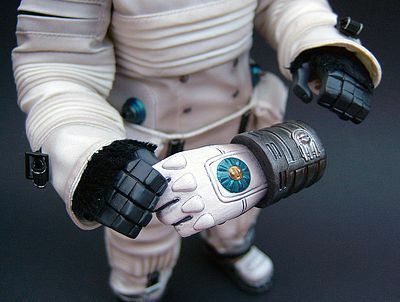 Toys for toys sake are invariably the coolest toys, its an unwritten law, and if it isn’t I’ll unwrite it! The only potential fly in the ointment might have been cost, but considering he was made in such a small limited edition, and comes with totally unique packaging, then I kind of see the price as an inevitability. And the red version was also made in a far smaller edition size than most figures released in (I’ve heard the number 1000 bandied around). So, taking all the factors into account this guy romps home with a full score from me. I’m sure his styling will divide the collectors, but again that can be a good thing as it means it wont end up in the wrong hands. I’ve even read that some people considered buying him to swap the head over… what the hell are these people smoking? It’s like buying Picasso’s Les Demoiselles d'Avignon so you can retouch the faces out and replace them with photos of your ex squeezes… put simply, it would be WRONG! 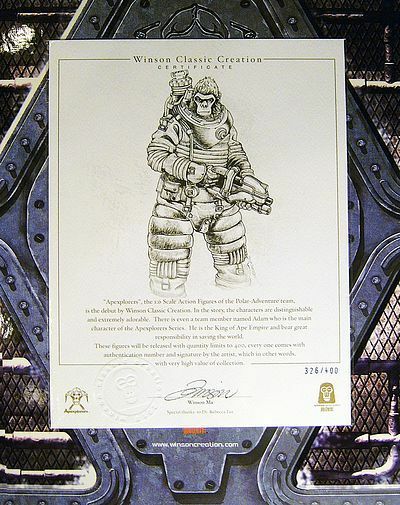 This has been a labour of love for Winson Ma, as he personally designed every element of it from the packaging with the certificate sketch, all the sculpting and costume design, right through to overseeing the production and distribution. If that ain’t dedication then what is? So, to sum up, this a great little piece of urban pop art, and one that will be cherished by all those that took the plunge, just stunning! Big Bad Toy store also has the red version in stock for $224.99 apart from that it’s time to hit the secondary market, where I’m sorry to say it might start getting very expensive. I’ve seen plenty of the red ones for between $189 to $220, but the white one is now between $380 to $450… Good luck!